Welcome, classmates, to the check-in line! Put in your information to let folks know how you have been and what you're up to these days ... then add a photo if you're able. 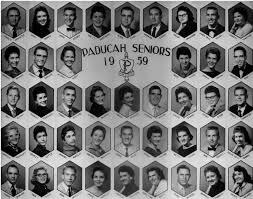 I CAN'T BELIEVE ITS BEEN 50 YEARS AGO THAT WE SO PROUDLY ACCEPTED OUR DIPLOMAS! I WANTED TO RENEW OUR VOWS IN PARIS FRANCE BUT HE SAID HE MIGHT CONSIDER PARIS VEGAS SOME COMPROMISE. WE HAVE 3 WONDERFUL SONS THAT LIVE CL0SE BY AND 4 GRANDCHILDREN. FOR DIRITO BROS IN W.C. I HAVEN'T MISSED ANY OF THE PREVIOUS REUNIONS AND AM REALLY LOOKING FORWARD TO THIS ONE. THANK YOU SO MUCH TO MY FELLOW CLASSMATES FOR ALL YOUR HARD WORK IN ORGANIZING THIS GREAT EVENT FOR US AND THANK YOU BRUCE CANT WAIT TO SEE MY TOTEBAG! LOOKING FORWARD TO SEEING YOU ALL SOON!!!!!! From Joan: Looking forward to our reunion, happy to find ya'll. Hopefully you can remember me. I actually married the fellow I went through Sequoia with--John Parker--who graduated in '57. We had two children, a girl Wendy, and a son Jack. My son was born with multi-handicaps, caused by birth defects from the "german measles" I caught while driving a school bus for our Sequoia High School back in 1965! (I was helping to get John through Law School and I did NOT know--I was pregnant) So, eventually I began to study Special Ed. and started to teach Sign Language at the college level. ( My son uses sign language for communication). John and I have divorced. He has remarried and has 6 new children and is a Retired Judge. I continued my education to earn two Master's Degrees. I retired from teaching at (CSUN) CA ST Univ. Northridge, after being in the earthquake down there (the 6.9 er!) Before that I taught at CSUDH where in addition to "Tennis" I also taught Gerontolgy and created a class called "Healthy Aging". I do love Southern CA--much to the objections of my NorCal relatives and friends! But now I live in Modesto because after the "Northridge Quake" I got very motivated to get out of there. I still teach "Healthy Aging" at Modesto Jr. College for the Institute of Continued Learning. I play the ukulele with a local "Uke-Band" and sing with a small 4 part double quartet (we visit local rest homes, etc.) I promise not to bring my uke to the reunion and am excited to reunite with lost friends--many of whom--like Mr. Steve Chell--I had the pleasure of growing up with. See you soon. From Ann: I t was a delight to see so many dear classmates at the reunion. How come 50 years seems in many ways like yesterday? Married in 1962 Scottsdale AZ 1962 to Jerry the love of my life now for 48 years. Flight School in AK, 101st Ft Campbell KY,birth of our son Cary 1963, a yr as an engenieer San Jose CA, Jerry joined Pan American Airways, birth of our daughter Tiffany 1967, move to Sparta NJ for 8 yrs to be close to Kennedy Airport in NY. We loved skiiing, competitive club tennis and living in a lake community, made dear friends but missed family so it was time to return to the west, Seattle WA, built our home on Mercer Island. I returned to school, became an academic advisor, needed to refocus so began working as a Sales Rep and enjoyed a great career traveling all over in an an exciting industry. Jerry transfered to United Airlines and retired as a 747 400 Capt. Our daughter married and has blessed us with three girls now 19, 16 and 7. The youngest is our little treasure from Korea who came to us at 41/2 months. Jerry and I have both reinvented ourselves with different careers, he in Morgage Protection and Annunities,and me as a consultant. We both love our work as it is all about relationships and making a difference in peoples lives. We both stay physically active bike riding, XC Skiing, Pilates and walking. This year 2010 we decided to down size and become downtown small city dwellers on Mercer Island. Blessings to each one ..... and may you find reasons to be encouraged daily as well as encourage others. First of all, “kudos” to everyone on the committee for the effort put into the reunion project – absolutely superb! And, “BRAVO ZULU” to you Steve for your leadership. To my very good fortune after graduation I dated, fell in love with and, in 1963, married a classmate I’m sure most of you remember – Bonnie Castiglioni. We have a bachelor son who is battling cancer, and a daughter who has given us two wonderful grandchildren. After working for a year at Eitel-McCullough with classmate Bob (Ruben) Lopez, I decided to make up for time misspent in high school. So, it was on to College of San Mateo and eventually San Jose State, where I graduated in 1966 with a BS in Chemistry. While attending SJS, I worked part time at Stanford Research Institute in Palo Alto, while Bonnie worked full time as a dental assistant in Redwood City. My college deferment finally expired, and one semester before graduation I received my draft notice in January 66. Classmate Bill Lightfoot experienced the same thing, and we took our draft physicals together. I’d always had a desire to fly, so I signed up for naval aviation at the Air Station in Alameda. I qualified and was granted a deferment to finish college to meet the Navy's program requirements. Because of Uncle Sam I was unable to accept UC Berkeley’s offer to do graduate work leading to a PhD in organic chemistry. We often wonder how different our lives would be if fate had allowed us to take that other path. Nevertheless, my Navy career was challenging and rewarding, and I really have no regrets about how things turned out. Bonnie and I began Navy life together in Pensacola, FL where I was commissioned a naval officer in January 67. Flight training followed and I received my wings in April 68. My first flying assignment was flight instructor duty for one year back in Pensacola. After that, I moved on to fly the land-based P-3 “Orion”, which I flew until my retirement. I served in squadrons at Moffett Field most of my career – lucky for us as a family – but spent quite a bit of time away from home base flying all over the Pacific, North Atlantic and Indian Oceans supporting operations in Vietnam, flying maritime patrol missions, and hunting Soviet submarines. We spent one year in Newport, RI while attending the Naval War College, two years in the Philippines, and I had a one-year tour of duty without family on the Indian Ocean island of Diego Garcia. I had several squadron deployments of six months each to the Philippines, Okinawa, Japan, and Iceland – all but one without family. I retired from 20 years active service with the rank of Commander and over 5,000 flight hours in the P-3. After the Navy I joinined The Boeing Company in Seattle where I trained foreign airline flight crews in the 747-400 flight simulator, authoried Flight Crew Operations Manuals for 747-400 and 777 jetliners, and finally retired in July 2007 after 17 years with the company. Bonnie and I love retirement living in the Pacific Northwest where our daughter and her family also live. We see our young grandsons regularly and truly love being involved in their lives. We both enjoy gardening and traveling -- taking annual vacations in Maui. We just returned from two weeks in France, and, of course, will travel to the Bay Area in October for the reunion. I enjoy fly fishing, fast cars, a love of airplanes I’ve had since a small boy, and all things technical. Bonnie and I keep in touch with Sequoia grads and classmates Jack Howell, Curt Talbott, Bill and Tish (Armistead) Lightfoot, Bev Ahl (Welsh), Trudie Highbaugh (Armistead), Bob & Kitsy (Neff) Menifee, and Bonnie Terrando (Selvitella). We are Looking forward to celebrating those days at Sequoia so long, long ago. See you all in October. From Yvonne (bonnie): After graduation from Sequoia I met Rick Arluck and we both attended San Mateo Junior College. I worked as a Dental Assistant for several years. Rick and I were married in 1963 and are still happily together. We moved to Pensacola, Florida when Rick was in Naval Aviation Officer Candidate School then flight school. During his 20 years in the Navy we lived in the Phillippines, Newport, Rhode Island, Okinawa and San Jose with our two children, Matt and Denise. I went to San Jose City College for several years taking music classes. After the Navy we moved to Issaquah, Washington and Rick took a job with Boeing. I worked for a short time as an office manager for a clothing distributor. Our daughter lives close by with her husband and two boys Luke 4 and Reece 18 months. We see them often and love being grandparents and retired. Rick and I are avid gardeners and had a large crop of green beans, beets and tomato's this year. Washington is the place to live for wonderful gardens. Everything grows here except for tropical so we spend a few weeks each year in Maui so we can enjoy tropical plants, flowers, surf, beaches and spectacular sunsets.